Become a Certified Senior Caregiver by taking an 8 or 10-hour online course meeting the requirements established by the senior home care industry. 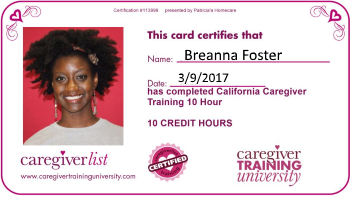 Many senior care companies train with the Caregiverlist Certified Training course and you may purchase and take this online caregiver training course. Digital caregiver training courses meet state guidelines for professional non-medical caregivers. Hourly requirements vary by state in U.S.A.
Caregiver training includes a 36-question exam (3 versions of questions allow you to take the re-take the exam to score higher, if needed) and a certificate in a wallet-size card or full-size to keep and show your employers and senior clients. Suggested books and movies along with a glossary of terms and sample care plan notes are also included in the online caregiver training courses. Spanish caregiver training is also available for certain states, including California: Spanish California Capacitacion Basica del Cuidador Caregiverlist. Review the Certified Professional Caregiver Training FAQ's. 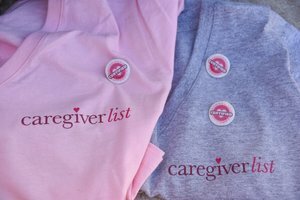 Caregiverlist Tutorial Videos on using Caregiverlist services. You may apply for a caregiving job to work as a companion caregiver while you are becoming certified. How to Detect, Report, and Prevent Abuse and Neglect. Bonus Section: Stroke Care and What Is Alzheimer's Disease?